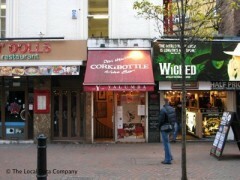 About: The Cork & Bottle Wine Bar is a small bar situated near the world famous Leicester Square. They have a extensive menu filled with luxury international dishes and a wine list to fully compliment the food. When I lived in the UK and traveled to London regularly on business, Cork and Bottle was my favorite chill out location. They have a broad wine list and good service staff. If you get a chance, sit at the table nestled into a niche in the wall. That was the favorite spot for my wife and I! !